Sherwood Forest and Yorkshire Museum. We did the short walk to the Major Oak, and then arrived back at the visitor's center about the time that it opened. A wonderful morning walk. It rained last night, so whenever the wind would blow through the trees, they would rain down a mist of water. The forest has these fantastically old oaks scattered out among much younger birches. We kept pointing out to ourselves stands of trees that are less than 20 years old, and were perhaps not there when Guni last visited. The new oaks and birches are growing straight and tall since they have plenty of light. Under the new trees which don't have the huge canopies yet, the forest floor was thick with ferns, brambles and wild flowers. The old oaks, of course, have enormous canopies that prevent any greenery from being able to grow underneath their boughs. The photos show how odd and entlike the Sherwood Oaks are. Sherwood has been a managed forest since the time of William the Conqueror. So the forest was never allowed to be dense (since then you wouldn't have been able to ride a horse through it to hunt in it.) But in the middle ages, the trees were carefully harvested and some of their practices actually lengthened the lives of the trees. One of the Medieval practices was called, "pollarding." You cut a tree down 2 or 3 yards from the ground. The top is used for lumber, then the tree will grow a ring of smaller trees around the top of it's stump. By cutting it off so high up, it keeps the deer and cattle from eating the tender young shoots. In 80 years or so the new growth can be harvested, and the process starts again. This happens naturally to the trees as well when lightening strikes them. Sometimes though the heartwood of a tree will rot away, leaving the living outer layer of the tree. In this case, the tree can no longer grow up, but continues to grow branches out. The oaks in Sherwood were cut down to build ships for Britain's Navy in the 1700s and 1800s. The several hundred oaks that are over 500 years old, are still there because there was something that made them unsuitable for use as lumber. Perhaps the heartwood was gone, or the tree had been lightening blasted and become a "stag horn" oak. So each of these great grandfather trees has an odd twisted shape somehow, and that is why they have survived. Their great grand-saplings will have a much easier time of it, since the forest is protected now. Looking at the Major Oak, the oldest of the English Oaks at 800-1000 years old, made my eyes tear up. The love that has been lavished on this tree for the last 200 years or so, trying to keep it alive. Its heavy limbs are upheld, any hole in its trunk has been patched so that the water cannot get in to rot it. A protective rail fence keeps people's feet from packing down the soil around its roots. They think it may have once been pollarded, which would explain its shape, although, it may simply be like the others that survived, a tree odd enough that the shipbuilder's axe passed over it. All along the trail were signs that had rhymes about hedgehogs. Ox stopped to take pictures of them because they were so amusing. 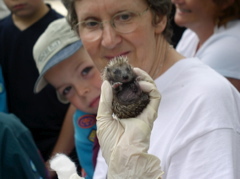 When we got back to the visitor's center, I bought a little stuffed hedgehog, and one of the conservationists who was there for "hedgehog" day, told me that she was going to feed a baby hedgehog in 20 minutes. Of course, I delayed our departure so that we could see the hedgehog. The little hedgehog is 14 days old and had just opened her eyes yesterday. The lady fed her and then gave her a bath and oiled her down with baby oil. Human skin is too acidic and would burn the baby if she touched her without gloves. I had been trying to see over the children, and so at the very end, the lady held the baby up for me to see. The little hedgehog will be released back into Sherwood when she's old enough and ready enough to take care of herself. Lots and lots of Roman artifacts. Okay so a quick break for the whole... Hey, look before the Normans invaded, before the Danes kept trying to invade, before the Saxons invaded... it was the Romans who invaded. So the Romans show up in the first century and make it clear they are planning to stay. They had 28 legions in Western Europe at that time. (That's 300,000 men). They had some initial trouble subduing the Celts, but in the way they are famous for, after conquering the Celts, they Romanized them. Hot baths, wine out of glass cups, fancy hairdos for the women... they had it all. So much so that when the Romans left 400 years later, the Britons didn't want to see them go. And really had begun to think of themselves as Romans. The museum has a lot of stuff left from the time of the Romans and from the Romanized Britons. Of course, Christianity caught on while they were there, so there are also Christian graves among the Roman burials. Then they have a room of Saxon artifacts, because after the Romans left, York fell into the hands of the Saxons. (Pagan at first, but then they Christianized. But haven't we gone over that part already?) The finds aren't as spectacular as the ones at the British Museum's Sutton Hoo display (which I went to last week.) But they are more the everyday items that people use. Spindle whorls, lasts for shoes, etc. The last bit of the museum had bits and pieces from the destroyed abbey of St. Mary's. St. Mary's was an early 12th century abbey that was one of the richest in all of England. It's one thing to read about the dissolution of the monasteries and the destruction of the books and artwork, but it's much different to stand and look at the dead bones of a once magnificent church. The living churches that I've been to in the past few days are so heartening. St. Margaret's in King's Lynn, where the parish has never quite had enough money to keep up all the repairs, but they try, and the building is still the heart of their parish, holding services, ringing the bells, marrying the young and burying the dead. Still very much alive. I could touch the walls and know that I stand in that tradition of people who have worshiped there. They say that when York Minster caught fire in the 1980s that the whole town turned out to help save it. Then today to touch the sun warmed bones of St. Mary's and know that all the hours and love that people poured into the making of her, had been destroyed in a year's time. Very chilling. The monks were sent away November 1539, well before the church came down. So we ate at a pub in the old section of York tonight. It was all good food and so much cheaper than London! (We also had fresh pasties from a baker's shop in Woodland for lunch today. We snuck over to a private woodland and sat down to eat them up.) We ate and drank good beer and cider until we were stuffed and could barely walk back to the hotel. Maggie and I are turning in early, but Ox has gone out to take pictures of York Minster all lit up tonight. He really wants some nighttime photos of it. If they are good, I'll share them tomorrow.